Stephanie Liu and Thiomarie Matta mounted the exhibition under Joanne Quinn's direction. Metallic violet streamers dangle several numeral 16s above large stacks of books in the top center of the window. Copies of 16 Magazine covers create a border across the bottom of the window. The splash is all for the new Class of ’16. Because incoming first-year students take the two-semester Augustine and Culture Seminar (ACS), First-Year Experience Librarian Robert (Rob) LeBlanc worked with Joanne Quinn, Falvey graphic designer, to create an exhibition that not only welcomes students but informs them. 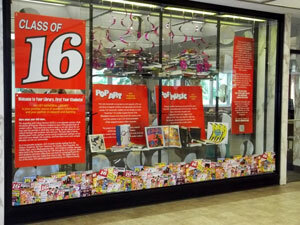 This large window display greets those entering the Library. In addition to a large “Class of 16” poster on the left, a “Welcome to Your Library, First Year Students!” poster introduces to ACS, alerting students that the course requires “a great deal of research to locate suitable multi-media and traditional academic resources” and explains that subject liaisons and the First-Year Experience Librarian are available to help. Featured are projects developed by John Immerwahr, PhD, and Jonathan Yates, PhD, in their ACS classes. Dr. Immerwahr’s project focuses on Pop Art and Dr. Yates’ plan centers on Pop Music. Prof. Immerwahr has long been an avid supporter of the arts and strives to integrate art history and appreciation into his ACS courses. Drawing from a wide variety of popular music ranging from rock & roll, to reggae, to jazz, students in Prof. Yates’ class research a single song by a popular artist and explore the impact that song and performer had on modern culture. New ACS students are advised to work with librarians by asking information desk staff to help them contact an appropriate librarian. Digital picture frames show rolling images of the ACS website and of students making presentations, both in classrooms and at the Philadelphia Museum of Art. Stephanie and Thiomarie did a great job on the window exhibit!